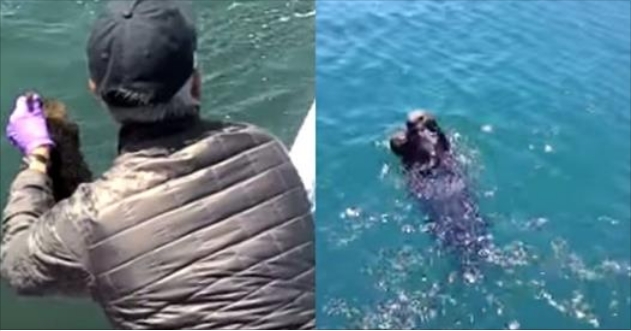 Marine mammal rescuers in California are celebrating a sweet and rare reunion between a mother sea otter and her baby, after the newborn was separated from her. Rescuers were alerted to the situation by concerned bystanders and responded. Mike Harris, a sea otter biologist with the state’s Department of Fish and Wildlife, Dr. Heather Harris, a veterinarian from The Marine Mammal Center, and a team of volunteers found the pup alone in Morro Bay, who they believe had been accidentally separated from its mother by a strong tide. While many lost pups may end up at a rehabilitation center, rescuers in this case decided that the baby was healthy enough to try a reunion and began searching for its mother. To try to find her, they had to ask around by going around the bay and testing reactions to the pup’s cries from other adults in the hope they would get a response. After the drop, mom was clearly thrilled to have her baby back and the two took off together. Rescuers add that there are very few successful reunions for sea otters, making this happy ending even sweeter. Responses to "Rescuers heroically reunite lost baby sea otter with its mother"